It would appear that the future is in gesture technology. This device, known as the Gesture Cube, is designed to meet the future head-on. 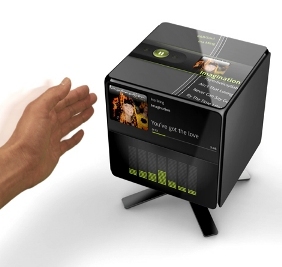 The Gesture Cube is essentially a five-sided display. It would have been six, but that stand has to go somewhere. There is a video for this after the jump, and you can see what you can do with it. I have to admit that this thing has the most unique gestures that I have ever seen. For example, the way a person can select music is gesturing to get a playlist, then more gestures to get an artist, then one more for a song. You will note in the video how all sides of this device are used in interacting with this experience. The video shows that a user can download files like photos to the Gesture Cube wirelessly. You will also note that this computer cube is designed to be in every room of the house, and how it will stop all activity when it detects that it is being carried elsewhere. It would be great if it was easy to recharge. Maybe there is a retractable cord on the stand to plug into the wall, or something. Well, this Gesture Cube is still a concept from a German design team, but it looks like something that you would see in a science fiction film. You never know what idea from a good science fiction film will jump off the screen and become reality.